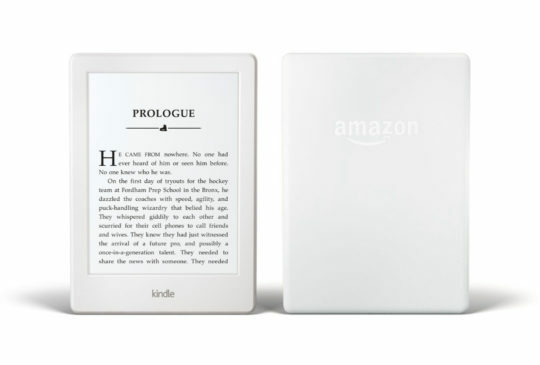 The 8th generation of entry-level Kindle e-reader is thinner and lighter, comes in White and Black, and costs $79.99. After almost two years, Amazon has presented the update of the most affordable Kindle model. The all-new Kindle 2016 is 11% thinner and 16% lighter than the 7th generation model. It’s the first Kindle that comes equipped with accessibility feature called VoiceView that activates via the built-in Bluetooth audio. The 2016 Kindle has the same price tag as its predecessor – $79.99 – and comes in two color variants: Black and White. 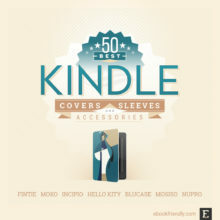 It’s worth mentioning that recently Kindle Paperwhite has been also released in White. between Kindle 8 and Kobo Touch 2.0. 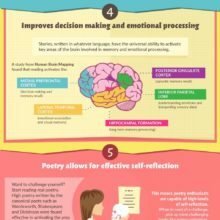 Keep reading, and you’ll reach the selection of images of the new Kindle, as well as excerpts from first reviews, a full product specification, and a detailed Kindle 8 infographic. 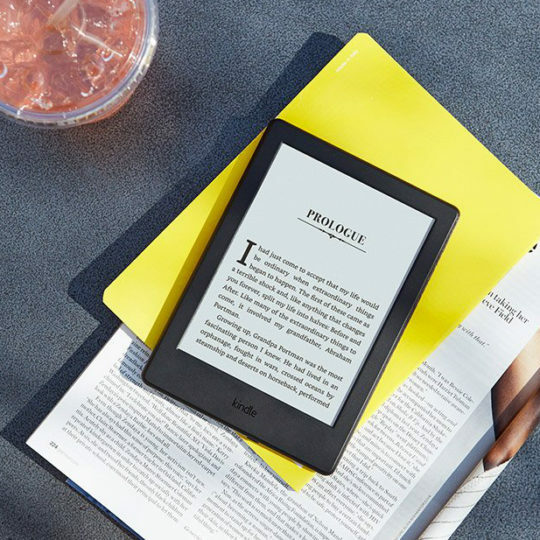 Amazon announced the new e-reader on June 22, 2016. The version with ads sells on Amazon.com since July 7. The release of the version without ads is July 30. 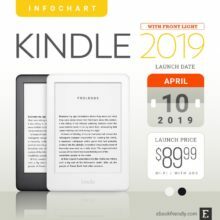 Kindle 8 (2016) without special offers – $99.99. These prices and release dates refer to the Amazon.com and for US customers, who can also buy the device in five monthly payments. 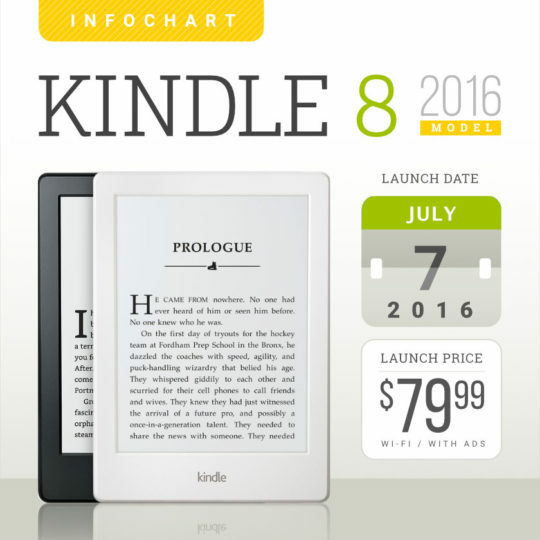 Kindle 2016 has also been revealed on other Amazon sites. 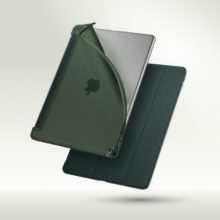 For instance, on Amazon.co.uk it costs £59.99. The release date is July 20, 2016. In France and other countries in the euro zone, the price is EUR 69.99, and the release date is also July 20, 2016. What about the version of Kindle 2016 addressed to international customers of Amazon.com? It’s there. Kindle 8 (2016) International costs $99.99 (as usual, $20 more than the US version). So far, it’s only available in black, but as soon as the white option joins in, we’ll inform about it. And if you don’t think the all-new Kindle has been improved enough, there is still a chance to buy the 2014 model. Its price has already been cut to $69.99. Many of the features and specs of the Kindle 8 are the same as in the 7th generation model. Some of them, such as the 800 × 600 px screen, seem insufficient for the needs of customers in 2016. Let’s have a look at what has changed and improved. 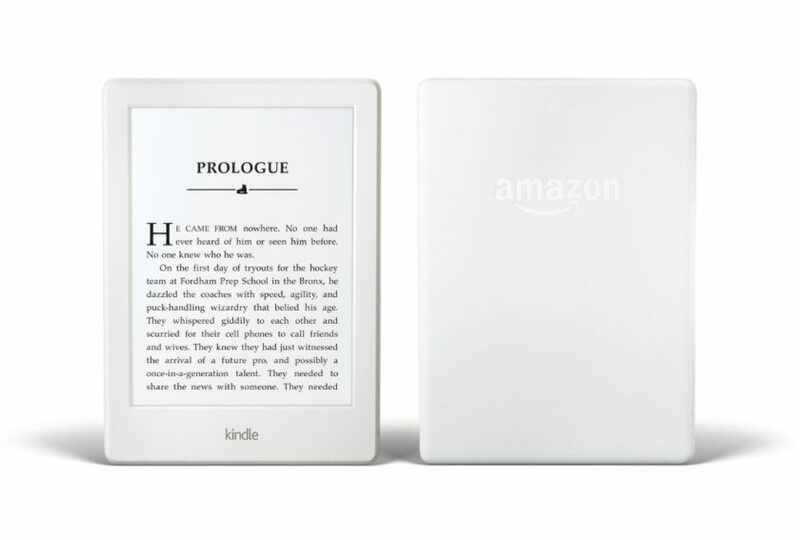 Along with the new Paperwhite, the 2016 Kindle is the first e-reader from Amazon since 2010 that is offered in North America in the white shell. It’s also the first Kindle since Kindle Keyboard that comes in two colors. The old good keyboard e-reader was available in White and Graphite. 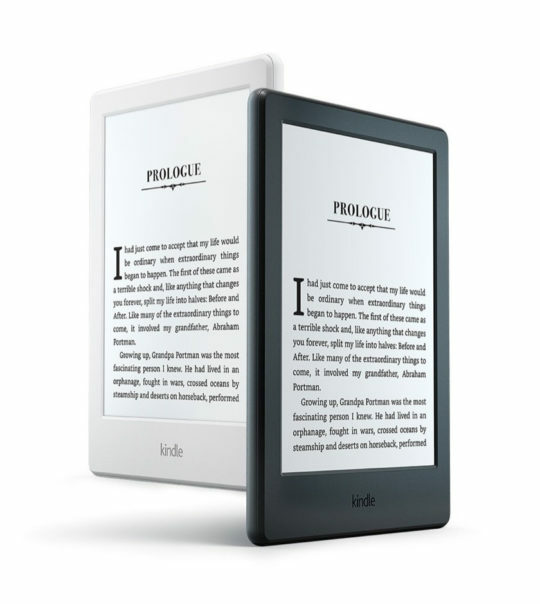 The new Kindle can be picked in either Black or White. The white version seems to be a perfect choice for women, as it makes a device look less technical and more pleasing. It also fits women’s outfit much better than the heavy-looking black version. Quite possibly, the “white” is not 100% white, but a very light gray. 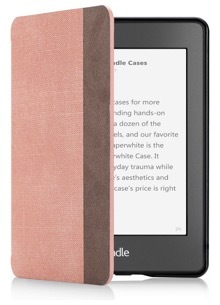 Based on the photos from Amazon, the color of the shell in Kindle 2016 is the same as the screen. And the E-Ink Pearl screen is not white. To eliminate the disappointment coming from the fact that the screen is darker than the outside, Amazon has most probably adjusted the color of the plastic to be similar to the screen. 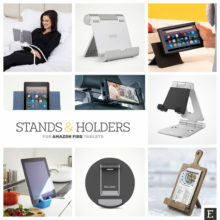 The 8th generation e-reader from Amazon is the first Kindle that comes with the built-in Bluetooth audio support. 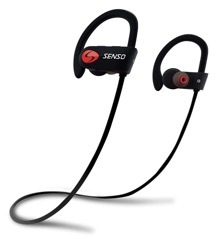 You may wonder whether it will be now possible to upload audio files and listen to the music via Bluetooth headphones. The answer is “no,” as music files are not supported by the new Kindle. 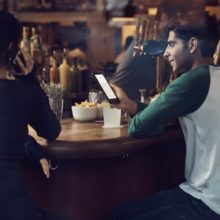 The purpose of adding Bluetooth support was different – to make the Kindle accessible by the blind and visually impaired persons. 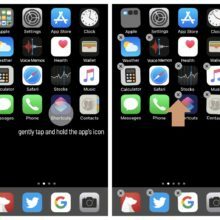 When you connect the Bluetooth audio device, headphones or a speaker, you can use accessibility feature called VoiceView, known from Amazon Fire tablets. VoiceView provides spoken feedback to describe the actions that take place on your screen. 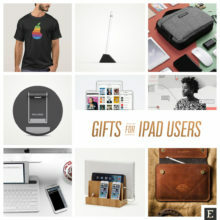 It reads the content of the screen – including books – without the need for an adaptor. The first thing you’ll notice in the 2016 Kindle is its smoother, more rounded shape. But what’s more important, the new device is considerably smaller than its predecessor, while maintaining the same proportions. 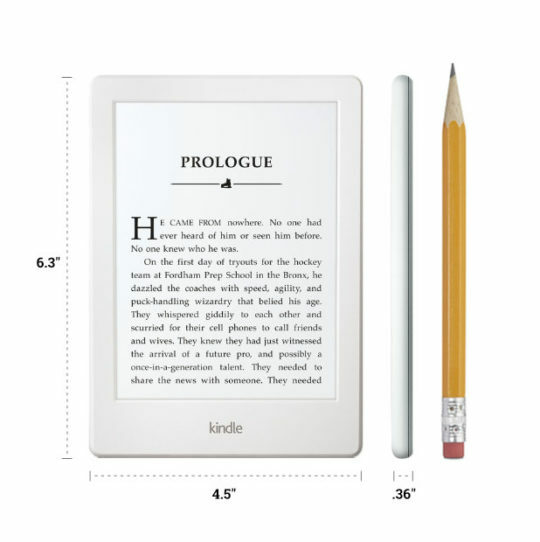 Kindle 8 is thinner by 1.1 mm than Kindle 7, what makes an 11% depth reduction. Its height is lower by 9 mm, and weight by 4 mm. With a considerably smaller weight (161 g vs. 191 g), you’ll find it much easier to read books one handed. 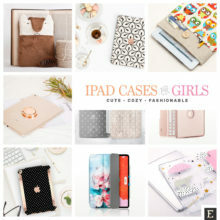 Are you counting on keeping the old case cover after updating the Kindle? There’s no good news. 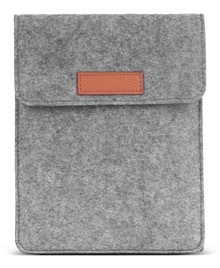 The dimensions of the new device are reduced to such a level that even cases with corner straps will not be suitable. Kindle 8 costs the same as its predecessor. What added value does it offer? First of all, it’s available in two body colors. The white version seems to be a perfect choice for women. Secondly, the 2016 Kindle features Bluetooth. 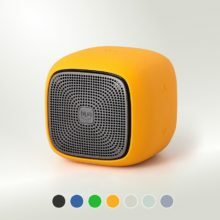 Thanks to that, the device can be operated by blind and visually impaired, via the connected Bluetooth audio device. In the press release, we read that the new basic Kindle has “twice the memory as the previous generation,” without specifying what kind of memory it is. Users might have the impression that they will now have a chance to store twice as many books. What has doubled is RAM memory, responsible for how the device operates. The memory has increased from 256 MB to 512 MB. Thanks to that, with the more advanced operating system (now and in the future updates) the device should work seamlessly, and without any lags. How does the new entry-level Kindle compare to e-readers from Amazon’s competitors? The natural choice for comparison is Kobo Touch 2.0. Released in September 2015, it features the same 167 ppi Pearl touch screen from E-Ink, and has the dimensions similar to Kindle 2016. Both devices offer 4 GB internal storage but lack front light, 3G connectivity, and external micro SD card slot. However, with a price tag higher by $10 than the 2016 Kindle ($89.99), Kobo Touch 2.0 doesn’t offer Bluetooth and the white body version. 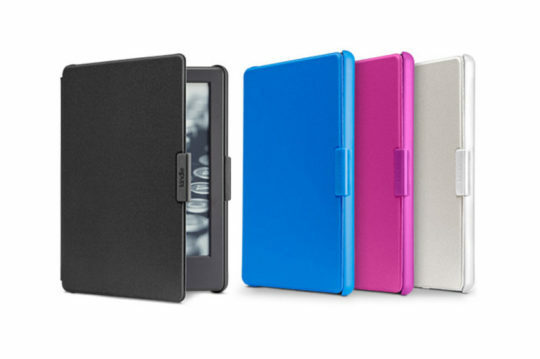 What’s interesting, its predecessor, the 2011 Kobo Touch was offered in five colors. When you decide to switch from Kobo to Kindle, or the other way round, you have to remember that changing the ebook platform is a painful process. Amazon and Kobo use different file formats and different DRM systems. 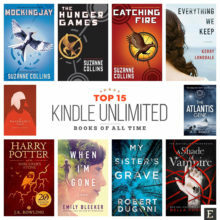 Below, you’ll find excerpts of the first reviews the new Kindle received from top tech bloggers. The changes here are as subtle as we’ve come to expect from Amazon. […] But they do give the cheapest device of the bunch a fresh coat of paint and a slight speed boost. 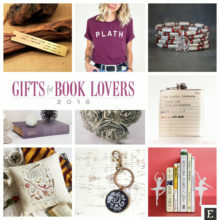 That may push some paper hold-outs toward purchasing an e-reader at last. It is much prettier than the 2014 model and it is in every way an improvement, but my enthusiasm is tempered by the fact that I was satisfied with the 2014 model and that I don’t need the accessibility features. 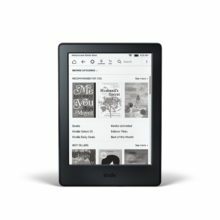 My biggest problem with the new Kindle is how dark and gray the screen looks. Maybe it’s partially because I got a white one and it highlights how not white the screen background color is. Holding the new white Kindle in my hands, I was struck by how solid a device it is. It’s roughly the size of a large paperback; but is less than half an inch thick. It weighs less than six ounces – the only Kindle that’s lighter is the high-end Kindle Oasis. There are also a few new reading features, but the entry-level template is otherwise unchanged, and this Kindle still doesn’t have a lighted screen. Below, you’ll find the most important tech specs of the 2016 touchscreen Kindle. 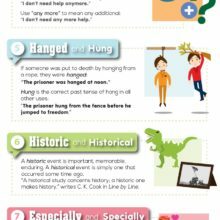 We’ve included all the most important features of the 2016 Kindle in this handy infographic. 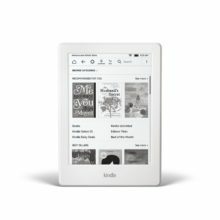 it also includes a timeline of all white Kindle models. Enjoy! 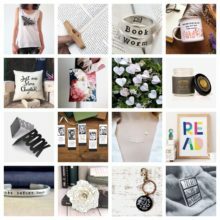 Feel free to share this image on your blog or in social media (Creative Commons license). Kindle doesn’t need the power to maintain a page of text, allowing you to read for weeks on a single charge. All images: Amazon, The Verge.